The Colts are progressing nicely as Andrew Luck improves and develops. Coming off of a strong season and an appearance in the AFC championship, Indianapolis is primed to take another step forward. The additions of Andre Johnson and Frank Gore should help the Colts on the offensive side of the ball, while Trent Cole and Nate Irving will help the defense. Additionally, playing in the AFC South with Jacksonville, and Tennessee should prove favorable for Indy's quest for a #1 seed. In 2015, look for excellent offensive numbers, a solid defense, and another trip to the playoffs (possibly the Super Bowl) for Andrew Luck and Company. The diversity in the Colts offense makes for fewer fantasy superstars, but makes the unit as a whole tough to defend. Therefore, Andrew Luck will be a very good option at QB, and the rest of the skill positions will have good, not great stats. Additionally, the offense has a nice end-of-season schedule, finishing with Atlanta, Tampa Bay, Pittsburgh, Jacksonville, Houston and Miami in weeks 11-16. 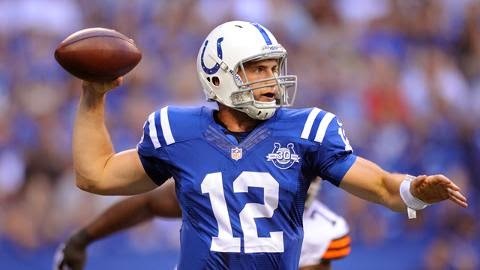 Go ahead and target Luck as well as look for solid value out of the other Indianapolis playmakers. The Indianapolis defense was a mixed bag in 2014, ranking 19th in points allowed and 11th in yards allowed. The squad will likely be similar in 2015 with Nate Irving adding depth in the middle and Trent Cole adding an attacking defender to rush the opponent's QB. We see top 10 potential from the unit and expect them to be a solid, cheap DST option in redraft leagues.